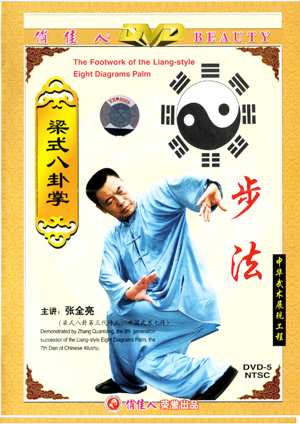 The toe-out step and toe-in step are the main footwork in the Eight Diagrams Palm, and integrated with other steps in the training and actual combat. The footwork, together with stake exercises and walking on circle supplement and complement each other. They are footwork, leg techniques, feet techniques and attack or defense skills all in one. The footwork of the Eight Diagrams Palm are linked each other and full of change. They can be practiced in single links, in straight links or in circles, each of which can also be further divided into fixed, slow, low framed or paired exercise.